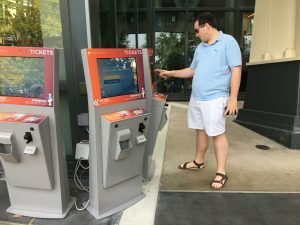 I recently took a day trip to Seattle to check out how our new investment, GuestX, is performing for its anchor customer in that city, the Seattle Space Needle. GuestX has developed a ticketing and engagement platform for tourist attractions that has served over 7 million customers and transacted more than $125 million of revenue for the Space Needle and other attractions it provides as a bundled option in its ticketing process. I was completely blown away with what I saw. First, the ticket window, whose queue used to stretch for blocks at busy times, has been supplemented by a dozen ticketing kiosks around the facility, and at least one mobile kiosk. Next, the VR experience tourists receive upon entering is amazing, and is a truly brilliant way to capture their contact info. It’s proven that consumers are happy to share that info as long as they receive value in return. 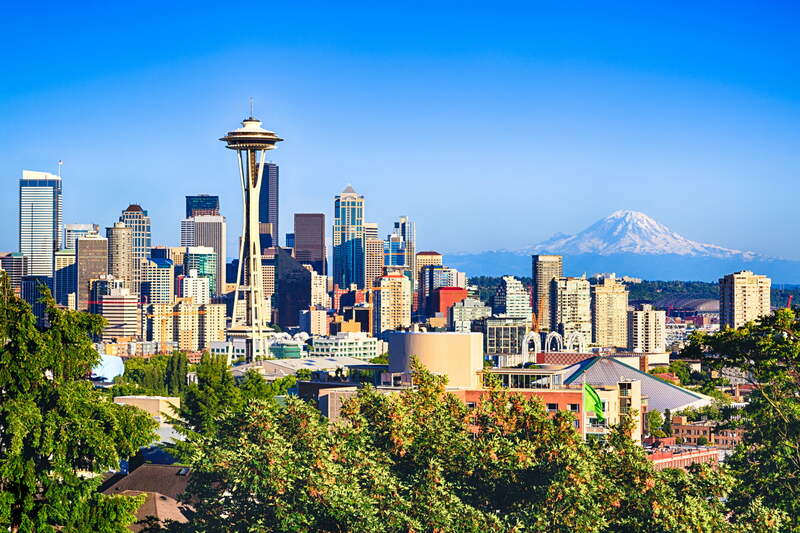 The way GuestX has developed interactive technology – from ticketing kiosks, to the VR experience, to photo opportunities both at the base and the top – has been key to the Seattle Space Needle’s ability to increase the ticket price without pushback from tourists. The increased ticket price is vital, as increased revenue is what will pay back the multi-million dollar renovation now being completed to the attraction. Hope to see many other tourist attractions utilize the GuestX platform to up their game plans! 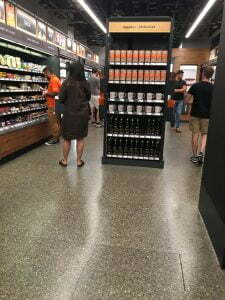 I couldn’t visit Seattle without checking out the new Amazon Go convenience store, which is just a short walk from the Space Needle. Amazon now occupies a large swath of downtown, so this store would probably do fine just serving its employees. 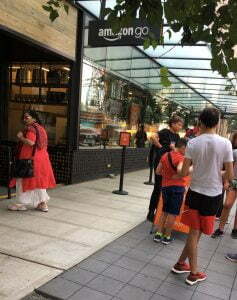 It was easy to find, as there was a swath of curious tourists outside on the sidewalk. First thing one has to do is download the app, which opens with a QR code that enables entry to the store – easy. 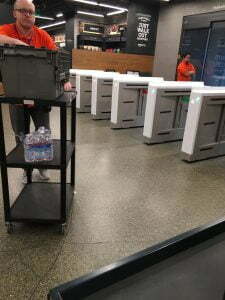 Once in the store, the first thing I noticed was the high number of Amazon employees in the store, at least one per customer. One was checking the entry/exit, a few were restocking shelves, a few were helping customers, and one was checking ID’s for alcohol purchases. Why so many for an automated store, I wondered? For one thing, so many customers are trying to trick the system (e.g. picking up items, then putting them back in the wrong place) that it clearly takes extra work. After all, this is such a high-profile experiment that there’s no margin for error. Better to have a squad of Amazon ambassadors there to ensure accuracy and answer all the questions. I was issued a free Amazon Go tote bag (thanks!) and picked up five random items. About two minutes after exiting the store, the app pinged me with the receipt, which was accurate. Question: Why wouldn’t the receipt be instantaneous? Is it possible that a replay of my visit was double-checked by a human? My take is that this concept isn’t quite perfect yet. When it is, we’ll know really quick, as there will probably be one on every street corner!